This week I went to one of my partners workshops, 1. As support and 2. As a participant. Amongst the evening, the spotlight was in me and I was being asked to describe my best day ever seeing clients. Now rewind hours before when I had been pre-menstrual crying all. day. long. and feeling as though nothing in my life was working (gotta love our cycles hey). So, I tried my very best to say something nice, without sounding like I really didn't give a f*#k.
"I'd wake up, do yoga, have brekkie, see a few clients, have lunch, see a couple more, then have dinner with my feet up". Hardly enthusiastic. Not an inch of excitement really. And I thought they'd take my lame response and move onto someone else. Nup. Not a bar of it. Which of course always serves you well, but in the moment, you wish the'y move on. 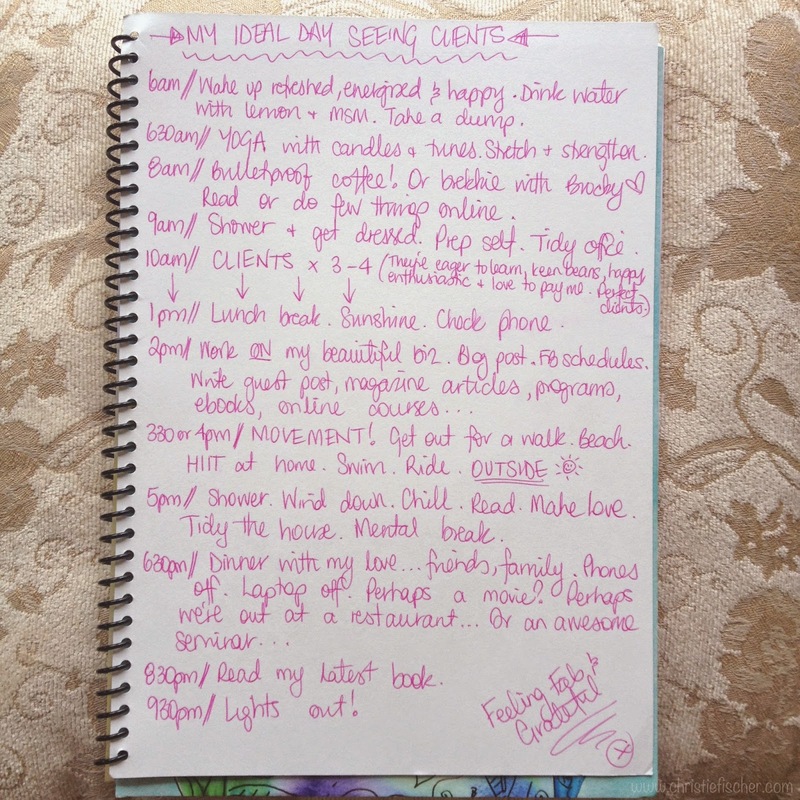 I was then asked my another chic there "What would your best day ever with clients look like? Not your average day, but your BEST day?" I began describing what sorts of clients I would be seeing ~ the fun, enthusiastic ones that try everything I suggest and come back knowing what works and what doesn't. The ones that are excited to see me and are happy to pay me. The clients that I get excited to see and can't wait to high-five them for their stellar efforts! I dug deeper into how many clients I'd ideally love to see each day, and what the rest of my time would be filled with - or not filled at all. How I wanted to F E E L and when I wanted to switch off from technology. So much so that I lit up, everyone else lit up, I felt waaaaaaay more excited about my work and who I wanted to see, and knew when I left that I had to write it all down. In doing such a simple exercise, you are illuminating the path that you know you want to take, but perhaps are yet to see. Kinda like the Yellow Brick Road that just kept appearing step after step. Visualisation is a powerful tool. Inking your words with pen is a powerful tool. Speaking your dreams aloud is a powerful tool. Add them all together!!! And read it out loud daily whilst feeling the sensations of how you will F E E L everyday doing what you love!!! Double Winner Whammy!! So I invite you to do the same. It may not be seeing clients. It may be serving customers at your retail store, or spending your days as a stay-at-home-mamma. Perhaps you're travelling the globe for speaking gigs regularly. What is your Best Ever Day doing what you love? 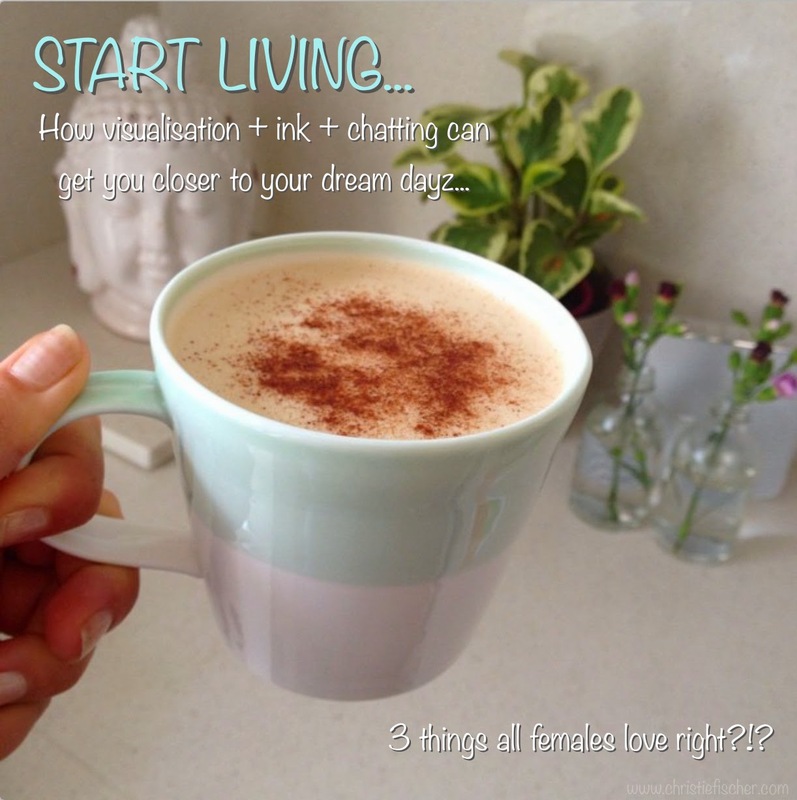 And you don't have to be living that now - obviously - this is to get you to a place of feeling and then believing it is possible and yep, you can have everything you want my dear! Oh and by the way - as a nutritionist, do you grow and pick and eat the majority of your own food ??? Hi Jamie, Where we lie now we currently only have herbs growing in the garden but I would love one day to have a massive veggie patch with plenty of organic foods to eat!